Hilda of Whitby, "A Most Religious Servant of Christ"
Virtually everything we know about the extraordinary woman now most commonly known as "Hilda of Whitby" comes from the early Christian historian Bede. In his Historia ecclesiastica gentis Anglorum (translated variously as The Ecclesiastical History of the English People or A History of the English Church and People), he devotes an entire chapter to "The Life and Death of Abbess Hilda" (Book 4, Chapter 23). 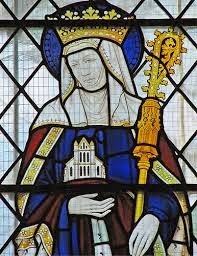 Bede begins with Hilda's death, noting that on 17 November 680, when she was sixty-six years old, Hilda, the abbess of Streanaeschalch, died. It is interesting that here, in his extended discussion of her, Bede uses the older name "Streanaeschalch," a Saxon or Celtic place name, rather than "Whitby." Earlier in his history, Bede translated the word "Streanaeschalch" as "The Bay of Beacon." Hilda was the daughter of a Northumbrian nobleman, Hereric, and his wife, Breguswith, brought up in the court of her paternal uncle, King Edwin of Northumbria. In 627, after his marriage to the Christian princess Ethelburger, Edwin was baptized on Easter Sunday, 12 April--and Hilda was probably among those baptized with him. According to Bede, Hilda's "life on earth" was divided into "two equal parts": she spent her first thirty-three years living in the world, "most nobly" dedicated to "secular occupations," the second thirty-three years in the monastery, living "even more nobly" by dedicating herself to God. But Bede provides no information about that first part of Hilda's life, from her birth, probably about the year 614, until 647, when the second half of her life begins. His biography of Hilda begins with her decision to join the religious life. Having made her decision to "abandon the secular life," Hilda had at first planned to live as a voluntary exile, renouncing not only all of her possessions but her home, and to join her sister in the monastery of Chelles, near Paris. Instead, she is "recalled home" by Bishop Aidan of Lindisfarne and returns to Northumbria, where she is at first given a piece of land "where she observed the monastic rule with a handful of companions." After a year, she is installed as the abbess of Hartlepool, where she devotes herself to establishing a religious way of life for the nuns--following Aidan's practice, this would have been a Celtic monasticism, rather than a Roman form, like the rule of St. Benedict. Then, as Bede continues, after she had ruled this monastery "for some years," Hilda herself "undertook to found or organize a monastery at a place known as Streanaeshalch," carrying out the task "with great energy." The establishment of Whitby, as it came to be called, was a double monastery in the Celtic tradition--that is, the monastery housed both monks and nuns, who lived separately but worshipped together. Her monastery became a center of learning. Bede relates that five men from Hilda's monastery later became bishops, and in the monastery was also found the poet Caedmon--Bede tells his story and transcribes the earliest known English poem in the chapter that follows his biography of Hilda. In 664, Hilda hosted the Synod of Whitby at her double monastery. Celtic and Roman traditions differed on two key points: how the date of Easter should be calculated and how monks should be tonsured (that is, how the hair should be shaved from a monk's head as a sign of humility and devotion). Although "Abbess Hilda and her community," in Bede's words, supported the Celtic traditions, the Synod ultimately decided in favor of Rome. Bede recounts the arguments made by each side; while she may have hosted the Synod, Hilda did not take part in the debates, at least as Bede preserved them. But Bede does note that "all her acquaintances" called Hilda "Mother" because of her "wonderful devotion and grace." She lived as "an example of holy life" not only to the monks and nuns of her community but to all men and women: "she also brought about the amendment and salvation of many living at a distance, who heard the inspiring story of her industry and goodness." Her life, Bede notes, "was the fulfillment of a dream which her mother Breguswith had when Hilda was an infant": she dreamed that she "discovered a most valuable jewel under her garments," a jewel that "emitted such a brilliant light that all Britain was lit by its splendour." This "valuable jewel" was Hilda, "whose life afforded a shining example not only to herself but to all who wished to live a good life." For the last six years of her life, Hilda suffered a serious and debilitating illness; as Bede notes, quoting St. Paul, "her strength might be made perfect in weakness." Nuns far from Streanaeshalch experienced miraculous visions of her death, and miracles were reported at her tomb. She was recognized as a saint shortly after her death. In 867, Danish invaders destroyed her monastery. I've used my very old Penguin edition of Bede's A History of the English Church and People here, translated by Leo Sherley-Price; there is new Penguin edition, published with the title Ecclesiastical History of the English People, with a new introduction and an account of Bede's death by Cuthbert, but it's still Sherley-Price's translation.